The liver has vital roles in regulating, synthesizing, storing, secreting, transforming, and breaking down many different substances in the body. The liver's unique ability to regenerate helps maintain these functions, even in the face of moderate damage or old age. Place your right hand over the area under your ribs on the right side of your body and it will just about cover the area of the liver. The liver is the largest gland, and solid organ in the body, weighing some 1.8 kgs in men and 1.3 kgs in women. At any time it holds approximately 13% (over 500ml) of the total blood volume, and uses 12-20% of our total energy to perform over 500 estimated functions. The liver is dark reddish brown in colour and is divided into the (larger) right and (smaller) lobes, which are further subdivided into approximately 100,000 lobules. About 60% of the liver is made up of liver cells (hepatocytes), which have an average lifespan of 150 days; the remaining cells form the biliary system. The liver receives its blood supply via the hepatic artery (30%) and the hepatic portal vein (70%), which transports nutrients from the intestine. Hepatocytes (liver cells) absorb nutrients, and also detoxify and remove harmful substances from the blood. This is a relatively soft tissue, with a unique ability to regenerate after injury. Approximately 75% of the liver needs to be damaged before its function is impaired. When the liver suffers long-term damage, scar tissue (fibrosis) forms and this disturbs liver function further. If the whole of the liver is scarred (fibrosed), then this is known as cirrhosis and without transplantation the outcome is likely to be fatal. Alcohol induced liver disease accounts for half of all adult liver disease, with about a third caused by viral hepatitis, and the remainder caused by a significant variety of diseases related to dysfunctional immune responses, metabolic disorders and inherited diseases. The gall bladder is a pear-shaped bag 9cm long with a capacity of about 50ml. Breakdown products, such as bile salts, bilirubin, cholesterol, phospholipids, proteins, electrolytes and water are secreted by hepatocytes, and they are eventually transported down the bile duct. This comes from both lobes of the liver, and joins the duodenum through a valve called the Sphinter of Oddi. The gall bladder stores the bile, a greenish-yellow coloured liquid, which assists with the emulsifying of fat in the food digested to allow easier absorption of fat and vitamins A, D, E and K. The liver produces approximately 500ml of bile a day. cholesterol, and bile components. Finally, by regulating blood levels of substances such as cholesterol and glucose, the liver helps maintain body homeostasis. a. Glucose. The liver plays a key role in the homeostatic control of blood glucose, by storing or releasing it as needed, in response to the pancreatic hormones insulin and glucagon. b. Proteins. Most blood proteins (except antibodies) are synthesized and secreted by the liver, e.g. albumin; decreased amounts of serum albumin may lead to oedema - swelling due to fluid accumulation in the tissues. The liver also produces most of the proteins responsible for blood clotting, called clotting factors. c. Bile. Bile is a greenish fluid synthesised by hepatocytes; secreted into the bile duct; stored in the gallbladder before being emptied into the duodenum. Bile is both excretory and secretory – in addition to bile salts, it contains cholesterol, phospholipids, and bilirubin (from the breakdown of haemoglobin). Bile salts act as "detergents" that aid in the digestion and absorption of dietary fats. d. Lipids. Cholesterol, a type of lipid, is an essential component of cell membranes. The liver synthesises cholesterol, which then circulates in the body to be used or excreted into bile for removal. Increased cholesterol concentrations in bile may lead to gallstone formation. The liver also synthesises lipoproteins, which circulate in the blood and shuttle cholesterol and fatty acids between the liver and body tissues. 2. Storage. The liver stores glucose in the form of glycogen, and also fat-soluble vitamins (A, D, E and K), Vitamins B6, and B12 , and minerals such as copper and iron. However, excessive accumulation of certain substances can be harmful. 3. Purification, Transformation, and Clearance. The liver removes harmful substances from the blood and breaks them down into less harmful compounds. It also converts most hormones and drugs to less active products. b. Bilirubin. Bilirubin is a yellow pigment formed as a breakdown product of red blood cell haemoglobin. The spleen, which destroys old red cells, releases bilirubin into the blood, where it circulates to the liver which excretes it in bile. Excess bilirubin results in jaundice, a yellow pigmentation of the skin and eyes. c. Hormones. The liver plays an important role in hormonal modification and inactivation, e.g. the steroids testosterone and oestrogen are inactivated by the liver. Men with cirrhosis, especially those who abuse alcohol, have increased circulating oestrogen, which may lead to body feminization. d. Drugs. Nearly all drugs are modified or degraded in the liver. In particular, oral drugs are absorbed by the gut and transported to the liver, where they may be modified or inactivated before they enter the blood. Alcohol, in particular, is broken down by the liver, and long-term exposure to its end-products can lead to cirrhosis. e. Toxins. 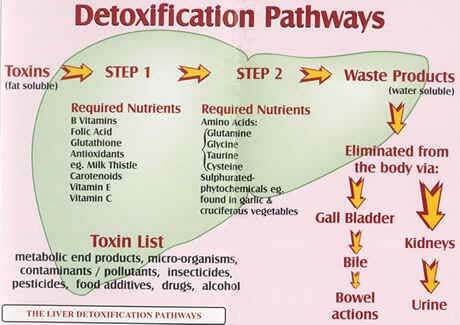 The liver is generally responsible for detoxifying chemical agents and poisons. The liver plays a vital role in fighting infections, particularly infections arising in the bowel. It does so by mobilising part of the body’s defence mechanism called the macrophage system. The liver contains over half of the body’s supply of macrophages (known as Kuppfer cells), which destroy any bacteria that they come into contact with. Viruses are the commonest cause but there are others, such as alcohol excess, the side effects of some drugs, both illegal and prescribed. There is also a disease called autoimmune hepatitis. The liver can fall prey to an alphabet of viruses, namely hepatitis A, B, C, D, E and possibly G. There isn’t a hepatitis F - it’s been missed out so far! The main difference between them is how they are spread and the effects they have on your health. Hepatitis A, B and C are the most common in the UK. Hepatitis A is spread by eating food or drinking water contaminated with the hepatitis A virus. It is confined to countries where hygiene standards and sanitation are poor. There is a vaccine for this virus and most infected people recover. Hepatitis B is passed on by blood-to-blood contact and also sexually. Globally, hepatitis B kills between 1 - 2 million people annually, yet there is a vaccine (passive immunity – antibodies are injected, giving short-term protection) to prevent infection. Blood transfusions have been screened in the UK since the 1970s. Hepatitis B is considerably more infectious than HIV. Hepatitis C is also blood borne, and since September 1991, all blood donations have been screened for the virus. Sharing needles to inject drugs or tattooing is a common cause. Even minute quantities of infected blood are dangerous. Hepatititis B and C can cause long-term liver disease, leading to cirrhosis and even liver cancer. In many cases there are no early warning symptoms until liver damage is far advanced. It is a popular misconception that cirrhosis only affects men who drink too much alcohol over many years! Cirrhosis can affect both men and women and can result from infection with hepatitis B and C viruses, as well as alcohol misuse. The onset of cirrhosis is usually silent with few early warning symptoms; it is the result of long-term damage. If the liver is briefly damaged the liver will regrow to its original size and shape, but when the inflammation is severe and continuous, scar tissue called fibrosis develops and the liver becomes much harder than normal – cirrhosis. This degeneration is irreversible. Not everyone who drinks too much alcohol develops liver damage -but there is evidence that it is due to a combination of factors including a genetic susceptibility. In general the more you drink, and the greater the frequency and duration of heavy drinking, the more likely you are to develop cirrhosis. Around 5 million people in the UK, (9% of the population), develop gallstones or another gallbladder disease at some time in their lives. 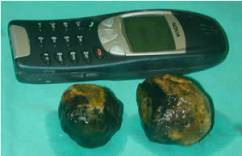 Gallstones are lumps of solid material that form in the gallbladder and usually resemble small stones or gravel, although some can be as large as pebbles. Most are the size of a pea and may take many years to grow. Anyone can get gallstones but middle aged, overweight women have the highest risk - fair, fat and forty traditionally describes a typical patient! Accidental or deliberate self-poisoning with paracetamol has been a serious cause of liver disease and transplantation in the UK, but in recent years it has declined - possibly due to a change in pack sizes on sale to the general public. Secondary or Metastatic Cancer i.e. cancer that has spread to the liver from another part of the body. There are an estimated 2,500 new cases of Primary Liver Cancer and 70,000 new cases of Secondary Liver Cancer every year in the UK. Death usually follows within a few weeks. In the UK most people who develop primary liver cancer have cirrhosis. Primary liver cancer is not easy to diagnose in the early stages because its symptoms are usually vague. Typical symptoms include loss of appetite, weight loss, a general feeling of poor health, jaundice, fever, fatigue and weakness. The kidneys remove urea and other toxic wastes from the blood, forming a dilute solution called urine in the process. The two kidneys have a very extensive blood supply and the whole blood supply passes through the kidneys every 5 minutes, ensuring that waste materials do not build up. The renal artery carries blood to the kidney, while the renal vein carries blood, now with far lower concentrations of urea and mineral ions, away from the kidney. The urine formed passes down the ureter to the bladder. The renal artery splits into numerous arterioles, each feeding a nephron. The arteriole splits into numerous capillaries, which form a knot called a glomerulus. The glomerulus is enclosed by the renal capsule (or Bowman’s capsule)- the first part of the nephron. The arteriole leading into the glomerulus (the afferent arteriole) is wider than the one leading out (the efferent arteriole), so there is high blood pressure in the capillaries of the glomerulus. This pressure forces plasma out of the blood by ultrafiltration. 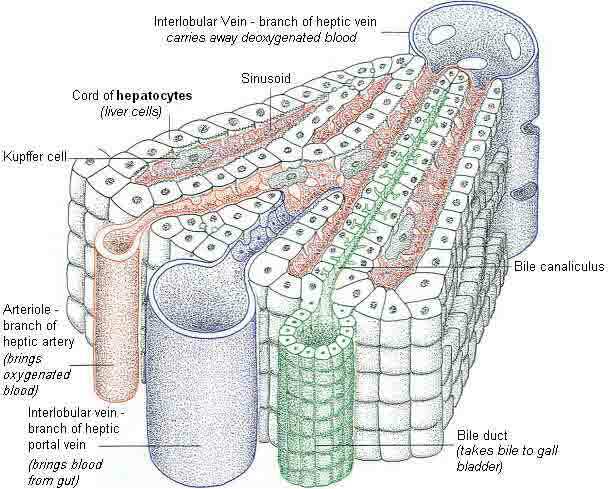 Both the capillary walls and the capsule walls are formed from a single layer of flattened cells with gaps between them, so that all molecules with a molecular mass of <70k are squeezed out of the blood to form a filtrate in the renal capsule. Only blood cells and large proteins remain in the blood. The proximal convoluted tubule is the longest (14mm) and widest (60µm) part of the nephron. It is lined with epithelial cells containing microvilli and numerous mitochondria. In this part of the nephron over 80% of the filtrate is reabsorbed into the tissue fluid and then to the blood. This ensures that all the “useful” materials that were filtered out of the blood (such as glucose and amino acids) are now returned to the blood. All glucose, all amino acids and 85% of mineral ions are reabsorbed by active transport from the filtrate to the tissue fluid. They then diffuse into the blood capillaries. Small proteins are reabsorbed by pinocytosis, digested, and the amino acids diffuse into the blood. 80% of the water is reabsorbed to the blood by osmosis. Surprisingly, some urea is reabsorbed to the blood by diffusion. Urea is a small, uncharged molecule, so it can pass through membranes by lipid diffusion and there isn’t much the kidney can do about it. Since this is a passive process, urea diffuses down its concentration gradient until the concentrations of urea in the filtrate and blood are equal. So in each pass through the kidneys half the urea is removed from the blood and half remains in the blood. The job of the loop of Henle is to make the tissue fluid in the medulla hypertonic compared to the filtrate in the nephron. The purpose of this “salt bath” is to reabsorb water as explained in step 5. The loop of Henle does this by pumping sodium and chloride ions out of the filtrate into the tissue fluid. The first part of the loop (the descending limb) is impermeable to ions, but some water leaves by osmosis. This makes the filtrate more concentrated as it descends. The second part of the loop (the ascending limb) contains a Na+ and a Cl- pump, so these ions are actively transported out of the filtrate into the surrounding tissue fluid. Water would follow by osmosis, but it can’t, because the ascending limb is impermeable to water. So the tissue fluid becomes more salty (hypertonic) and the filtrate becomes less salty (hypotonic). Since the filtrate is most concentrated at the base of the loop, the tissue fluid is also more concentrated at the base of the medulla, where it is three times more concentrated than seawater. In the distal convoluted tubule certain substances are actively transported from the blood into the filtrate, in other words they are secreted. It is relatively short and has a brush border (i.e. microvilli) with numerous membrane pumps for active transport. The important point about this secretion is that it is regulated by hormones, so this is the homeostatic part of the kidney. Substances secreted include H+ (for pH homeostasis), K+ (for salt homeostasis), ethanol, toxins, drugs and other “foreign” substances. As the collecting duct passes through the hypertonic salt bath in the medulla, water leaves the filtrate by osmosis, so concentrating the urine and conserving water. The water leaves through special water channels in the cell membrane called aquaporins. These aquaporin channels can be controlled by the hormone ADH, so allowing the amount of water in the urine to be controlled. More ADH opens the channels, so more water is conserved in the body, and more concentrated urine is produced. This is described in more detail in water homeostasis later. The collecting ducts all join together in the pelvis of the kidney to form the ureter, which leads to the bladder. The filtrate, now called urine, is produced continually by each kidney and drips into the bladder for storage. The bladder is an expandable bag, and when it is full, stretch receptors in the elastic walls send impulses to the medulla, which causes the sphincter muscles to relax, causing urination (or micturition). This is an involuntary reflex response that we can learn to control to a certain extent when we are young.